The first monastery in Goshiv was founded in 1570, at the foot of nowadays monastery in the valley “Black rustler”. But this wooden structure was burnt by the Tatars. The monastery was again built up on the top of Yasna Mountain after the second advent of the Tatar Mongols and became known thanks to the miraculous icon of the Mother of God. In 1735 a copy of the miraculous icon of the Mother of God from the monastery of the town Belz in the Lviv region appeared in the estate of a wealthy nobleman Goshivskiy, residing near Peremyshlyany. Every Saturday this noble kindled a lamp in front of the icon and the family prayed. And this icon announced its miraculous power: once the wall of the estate and the icon on it remained intact during the fire. In 1736 there was a new miracle – the icon began to shine. When this light disappeared, the tears streamed out of the Mother of God eyes. The owner was afraid to keep on this icon because of such wonderful actions; he presented it to the monastery and almost became its founder, giving also a part of his property and income for its development. The monastery was named after its donor – Goshivskiy. At this time the monastery was built out of brick, since the wooden buildings had been three times destroyed by invaders during previous 200 years. The big magic caress of the icon has confirmed that the Mother of God selected the Yasna Mountain as a throne to receive the people’s regards. 117 records of the miraculous recovery, salvation, and other signs of powerful protection of the Blessed Virgin were added to the “Monastic Chronicle” by the end of the eighteenth century. Nowadays, people from all over Ukraine come and arrive to Goshiv Virgin to feel God’s mercy and grace. 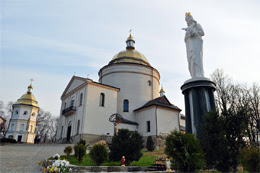 You have a great opportunity to visit Goshiv monastery during the Religious tour in Western Ukraine.